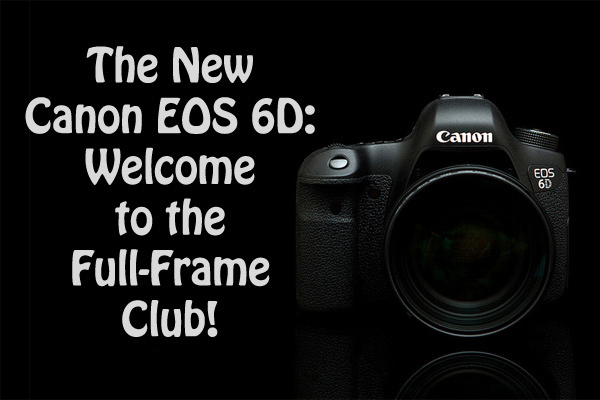 The New Canon EOS 6D – Welcome to the Full-Frame Club! Rejoice, Canon fans, for we have a new Canon EOS 6D coming. Preorders are already available at Adorama, Amazon and B&H Photo at the price of $2099 for body only, $2899 for kit with EF24-105mm f4L IS USM Lens. While technical specs have already spread all over the internet, we know that it would be a full-frame mid-size DSLR with 20.2 Megapixel CMOS sensor and Digic 5+ processor (just like in Canon 5D mark III). This will be a dream come true for those, who considered switching to full-frame, but found 5D Mark III too expensive, and 5D Mark II too outdated. It’s interesting that 6D body will cost pretty as much as 5D Mark II does now – around $2000. 6D has been mostly compared to 7D and Canon 5D Mark III these days, but let’s see what significant benefits 6D has over 5D Mark II. The new Digic 5+ processor – continous shooting: 3.9 fps in Mark II, 4.5 fps in 6D. 5D Mark II lacks the 1080 30fps, and also 1280 x 720 60, 50 fps mode, which I believe can be critical for videographers. 6D also offers high-compression IPB format and the ALL-I compression format. 6D allows refocusing using the autofocus by half-pressing the shutter button. 5D Mark II supports only manual focusing during video recording. 11 AF points in 6D against 9 in Mark II. 6D also claims to have higher AF sensitivity. ISO expansion up to 102400 – yep, 5D Mark II has the hightest value of 25600. These are extra two stops in 6D. Better LCD screen. Well, 5D’s screen is really uninspiring comapred to all newer models. 0.92 million dots in 5D Mark II versus 1.04 million dots screen in 6D does not make a big difference, but the colors and the contrast are just way better starting from 7D and even cheaper models like Rebel T2i (550D). SD cards in 6D, CF cards in 5D Mark II. Well, for me it is unlikely to be a benefit, I prefer CFs (though both types can fail at times). Weight: 6D is 680 grams and 5D Mark II is 810 grams. Well, in a number of cases 130grams do make a difference. 6D boasts GPS receiver and WiFi transmitter. This is great, but, as rumored, 6D’s WiFi does not support transmission of RAW files, but is meant for sending JPG files and video clips to devices like smartphones, photo printers etc. This is cool to play with, and can be handy to review your JPGs on a PC tablet for example, but that’s it. HDR mode will allow 6D users to create HDR photos from three separate exposures in-camera, without the need of post-processing. It also features a Multiple Exposure mode which allows to combine several individual images into a single composite image, again, without post-processing on a computer. What can I say, I use the 5D Mark II, and I am totally happy. The most important for me is how much noise will a sensor have in RAW images with ISO values up to 1600. It would be even fine to have 1 AF point in the center, 2-3 fps continuous shooting speed and manageable noise at ISO 800 – yes, I am that unpretentious. What do you think, will you upgrade to 6D (from what model? ), or maybe you will consider it as a second body? A friend of mine was eager to get himself a reasonably priced full-frame body couple of days ago, and I recommended him getting the 5D Mark II. But just as 6D was announced, I believe Mark II is no longer an option for those looking for an upgrade of their crop sensor cameras. But 6D has a very strong rival – a Nikon D600 that was announced somewhat earlier – on September 13th, 2012. It is already in stock at Amazon by the way.